England Saxons booked their place in the Churchill Cup final with an impressive 41-14 win over Tonga at a rain-soaked Kingsholm on Sunday afternoon. Just as they had been in their demolition of the United States in their opening Pool A fixture, the Saxons' forwards were utterly dominant in the scrum and their set-piece superiority yielded three penalty tries. Jordan Crane and Billy Twelvetree scored the hosts' only two tries from open plays, while fly-half Rory Clegg contributed 16 points with thes boot. Tonga played with predictably ferocity and no shortage of skill, managing tries through lock Sione Timani and openside flanker Pepa Koloamatangi, but they simply had no answer to the power of the Saxons' set-piece. The Saxons, who will now face Canada in a repeat of last year's final, started well with London Irish winger Topsy Ojo making two purposeful thrusts down the left flank early on with home favourite Charlie Sharples just failing to take his pass from the second of those bursts. But the first try came from a more direct route as the Saxons front row of Matt Mullan, David Paice and Matt Stevens simply destroyed their opponents from a five-metre scrum, and referee Romain Poite did not hesitate to award a penalty try converted by Clegg. The second try soon arrived as Clegg and then Ojo were held up just short before Crane, stepping in for the injured Luke Narraway, surged over to dot down, Clegg adding the extras for a 14-0 lead after 16 minutes. The Saxons continued to enjoy the better of the play and they were only prevented from adding to their tally by ill-discipline at the tackle area. Tonga only threatened sporadically, with their best movement seeing centre Suka Hufanga make a slashing break which eventually came to nothing. And the South Sea Islanders fell further behind after 33 minutes as another powerful Saxons scrum saw the Tongan eight disintegrate and Poite march underneath the posts once again. Clegg added the conversion and a penalty on the stroke of half-time to hand Stuart Lancaster's side a 24-0 interval lead. The Quins fly-half quickly added a further three points early in the second stanza after Tonga suffered more scrummaging woes. But Tonga creditably hit back as a series of England penalties gave them the field position for lock Timani, who will play for the Scarlets next season, to crash over for a try converted by Kurt Morath. 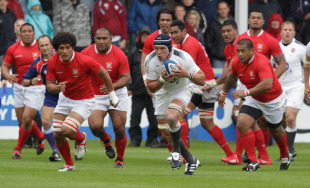 Twelvetrees missed the chance to get the Saxons fourth try when he spilled the vital pass after a fine break from Clegg, and the power of Stevens at scrum time soon meant they were playing 14 men as referee Poite ran out of patience with replacement Ta'u Fainga'anuku and sin-binned the prop. That left Tonga again defending a five-metre scrum and a man light they were again shunted backwards as they conceded a third penalty try. Twelvetrees then got his try as replacement Mike Brown launched a brilliant counter-attack which saw Crane put a grubber through for the centre to gather and score, with Clegg continuing his 100% record with the boot. Twelvetrees was sin-binned moments later before Tonga grabbed a late consolation through flanker Koloamatangi.